We review the two player card drafting game Tides of Madness by Portal Games. 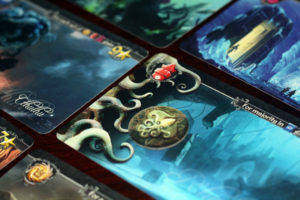 In this sequel to the hit 2015 game Tides of Time, two players are trying to draft the best set of cards from among the 18. I am not interested in licensed reskins of games. The IPs that have leant themselves to Monopoly, Love Letter and Risk (to name a few) do not excite me and truth be told, I actively avoid most games that even have a licensed IP on the box. Much to my chagrin, this has left me with a Legendary sized hole in my non-completist collection, but alas this is the price of principle and my burden to bear. For several years Lovecraftian horror has donned the covers of countless game boxes making the Cthulhu mythos akin to its own IP. Sure, there have been a few shining stars (Arkham Horror, Elder Sign and Cthulhu Realms for example), but we were also given some black holes (Cthulhu Fluxx, Cthulhu Munchkin and Cthulhu Gloom). At the time of writing, Wikipedia had no less than 48 games, cardboard and digital, listed in the games section of its Cthulhu article. 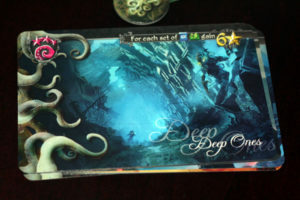 So, when Portal Games released their sequel to 2015’s Tides of Time called Tides of Madness, I was forced to consider if we even needed another Lovecraftian themed card game. For you, Reader, I sacrificed myself (and my girlfriend) to the Great One in this 20 minute two player drafting card game. 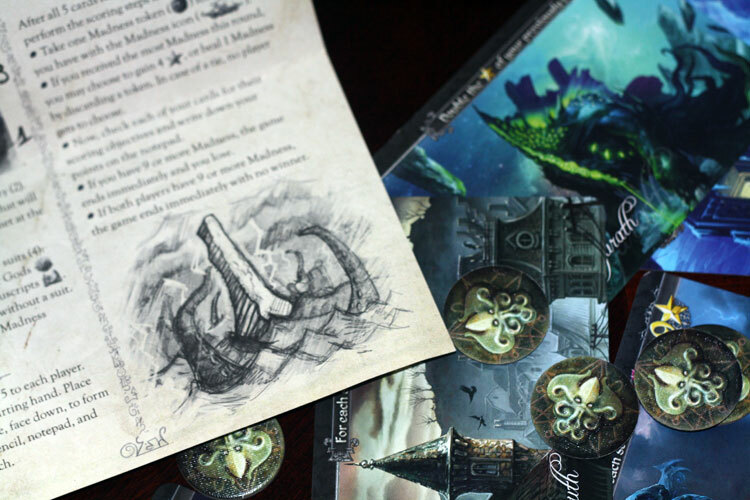 In Tides of Madness, players draft and play cards representing elder ones and places from the Lovecraftian mythos. This is in an attempt to combine suited cards and abilities, with the goal of accumulating the most victory points at the end of three rounds. Players have to be careful as the more rewarding cards can cost players their sanity. Too much madness and players lose immediately. The player with the most victory points at the end of three rounds wins. Even the rulebook has a nice thematic touch. As far as the quality of components is concerned, Tides of Madness exceeds the bar set by Tides of Time. Where Tides of Time is beautiful, Tides of Madness is memorable and downright frame-worthy. Thematically, the card artwork soars. All 18 of the cards seem like windows into the terrible and awesome world of the elder gods. In an effort likely to show off the artists’ talent as much as make the gameplay easier, the graphic design keeps the cards clean and uncluttered and the iconography is crystal clear. Going the extra mile, Portal Games carried the artwork to the inside of the box and maintained the theme on the rule sheet with seemingly handwritten rules and a roughly textured paper stock. Tides of Madness gameplay is the same as Tides of Time with one small change which I will touch upon later. The first phase of each round is drafting, the second is scoring and (for rounds one and two) the third phase is refresh. The game is won by scoring the most victory points at the end of three rounds. New to Tides of Madness is the inclusion of Madness tokens. Get too many of those and you immediately lose. In the game, there are four sets of suited cards and one set of unsuited cards. Victory points are earned by fulfilling requirements laid out by card abilities which tend to award players for different combinations of suited cards. 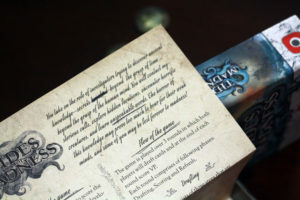 The difference between the gameplay of Tides of Time and Tides of Madness are the Madness tokens awarded by some of the higher scoring cards. The Drafting phase starts with each player drawing five cards, choosing one, and passing the remaining cards to the other player (7 Wonders style). Both players then reveal their chosen card at the same time. Play continues until there are no more cards in anyone’s hand. During the Scoring phase, Madness tokens and Victory Points are totaled up (in that order). Anyone who has 9 madness tokens immediately goes insane and loses the game. Assuming both players survive, the Refresh phase begins and each player chooses a card they played in phase one to keep in play, and one card to remove from the game. Cards are then drawn to bring the starting hands back up to five cards and the next round begins with the drafting phase. Lather, rinse, repeat for a total of 3 rounds or until a player loses his mind. 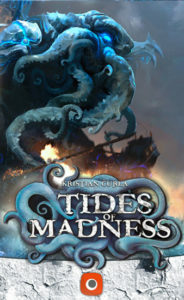 Tides of Madness builds off of the game play from Tides of Time, and adds its own twist. 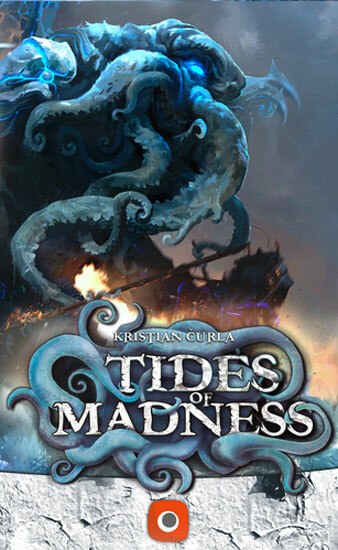 You are probably asking yourself, dear Reader, if Portal Games has differentiated Tides of Madness from Tides of Time enough to justify your time (and your money). On the surface they appear only to have placed it in a new set of skin, changed some card abilities and added a new push-your-luck mechanic, but fear not, more is lurking in the deep. I really enjoyed the artwork, possibly even more than Tides of Time’s. I, maybe like you, didn’t think Tides of Time was missing anything. The power to weight ratio of Tides of Time was near ideal. For the size and time commitment involved in the game, I never felt disappointed with a play through and win strategies had to be varied enough to last several card drafts. To tie this to the present, well, Tides of Madness does it better. The addition of the madness mechanic and the unique abilities of the unsuited cards freshens up the gameplay immensely. Lessons Portal Games learned from their first go around were implemented to great effect in the sequel. This is not a simple reskin or a shiny new paint job, and I don’t have a membership card from the “cult of the new;” this is the real deal and it plays like a great game because it is a great game. Previously, player interaction was limited to who out-drafted the other, but now a player can force game ending cards onto her opponent instead of just accepting a sub-par score. Really, there are two games at play here: the short game sees a player accruing points with reckless abandon for his sanity, while the long game player pushes the teetering sanity of her points-hungry opponent over the brink. The game plays very quickly, so what may seem like a limited number of play styles is actually quite fulfilling. Likewise, the number of card interactions is completely satisfying for a game of this size. There really isn’t that much time involved with a play through for limited strategies to feel like limiting factor. Portal Games tied theme, strategy and gameplay into a cohesive package that makes successive plays rewarding. On the surface Tides of Madness is easy to learn and easy to play, and yet at its center it’s still meatier than most 20 minute games. The rules are easy to learn, and the game plays quickly. Tides of Madness is one of my favorite games of 2016. It lives in my game bag for plays during set ups of larger games and for quick hour-long kitchen table tournaments. Employing the push your sanity mechanic is fun and maddening in its ability to tip players (me) from my-most-genius-moment to what-have-I-unleashed-on-myself. Tides of Madness doesn’t simply slap a Cthulhu paint job on its predecessor, it embeds the Lovecraftian mythos under its slimy green skin. Card art remains a high point and rivals that of Tides of Time which is saying something. As far as lowlights, there really aren’t any. 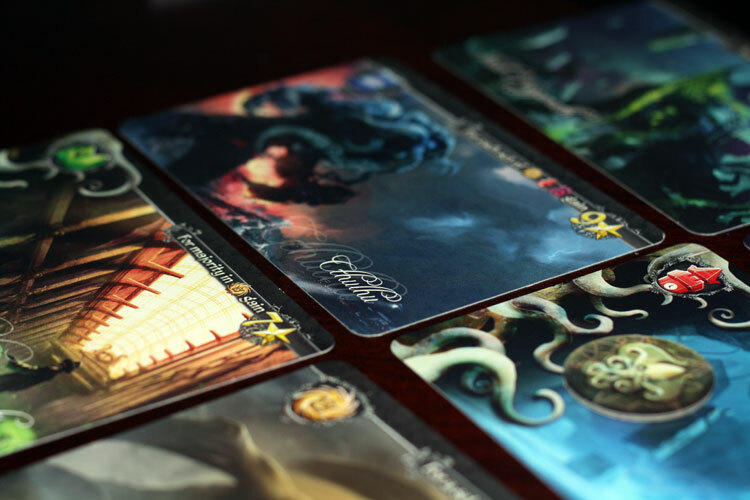 Tides of Madness is a light game that plays quickly and smoothly. It isn’t over reaching for its size, by any means. I would almost say that it could do with some more cards and a way of playing a longer game with more than two people, but that would change the game from what it is – a light little card game, toying with your sanity. You too can push your sanity for about $12. 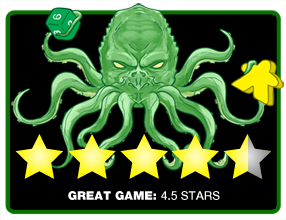 Final Score: 4.5 Stars – Way deeper than just some Lovecraftian skin tacked onto to the skeleton of a great game.